A numerical groundwater model was constructed to simulate groundwater flow in the Yauco Alluvial Valley aquifer. The model was constructed to evaluate future management options, including the potential to increase aquifer firm yield through a conjunctive management of ground and surface water. The model was exercised in both steady state and transient modes to analyze firm yield and the potential for conjunctive management of surface and ground water resources. The finite-difference, numerical model was developed to simulate ground water flow in the Yauco Valley. 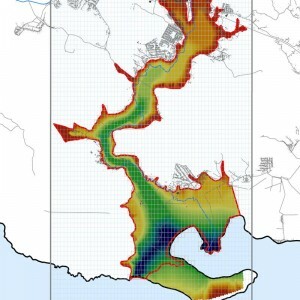 The single-layer model encompasses the entire alluvial deposits of the valley which extends from the Yauco town to the Caribbean Sea.